Mahnaz Collection presents a new jewelry exhibition: “London Originals: The Jeweler’s Art in Radical Times.” Featuring over 150 jewels from the 1960s and ‘70s from Mahnaz Collection, the exhibition opens on April 11, 2018 at Wright, 980 Madison Avenue in New York City. 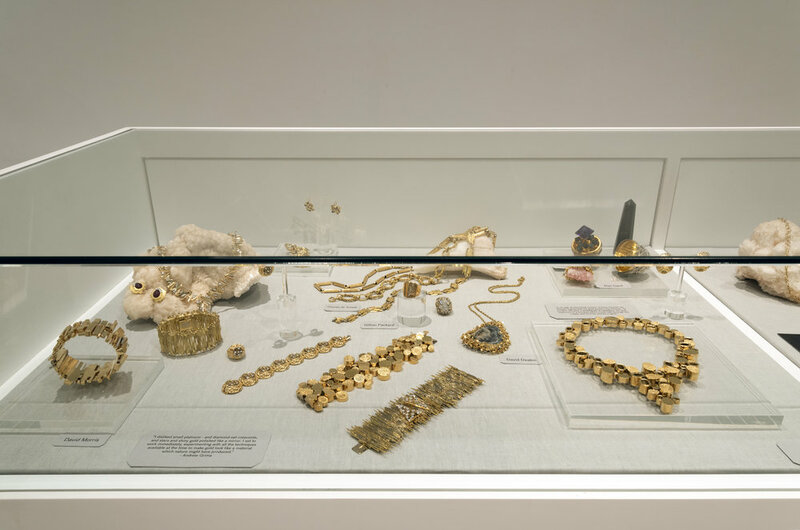 It showcases jewelers working in London during a period of seismic changes in the arts, architecture, technology, design, fashion, music, women’s rights and youth culture. 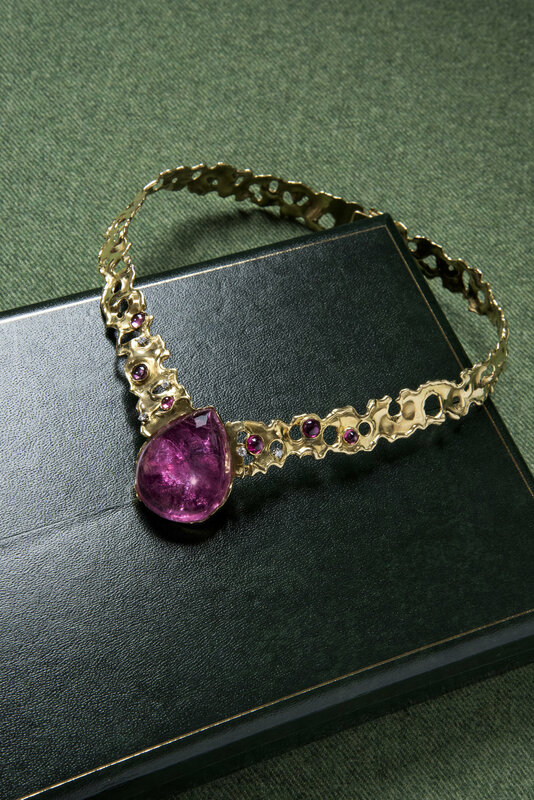 The sheer force of their free design sensibility fostered a renaissance in jewelry, resuscitated the moribund British jewelry world and made London relevant once more as a hub of innovation. This exhibition aims to provide new visibility in the United States for the London Originals, many of whom once had enthusiastic collectors here. Their influential and timeless modern jewelry merits attention from new jewelry audiences as well as those interested in art and design. 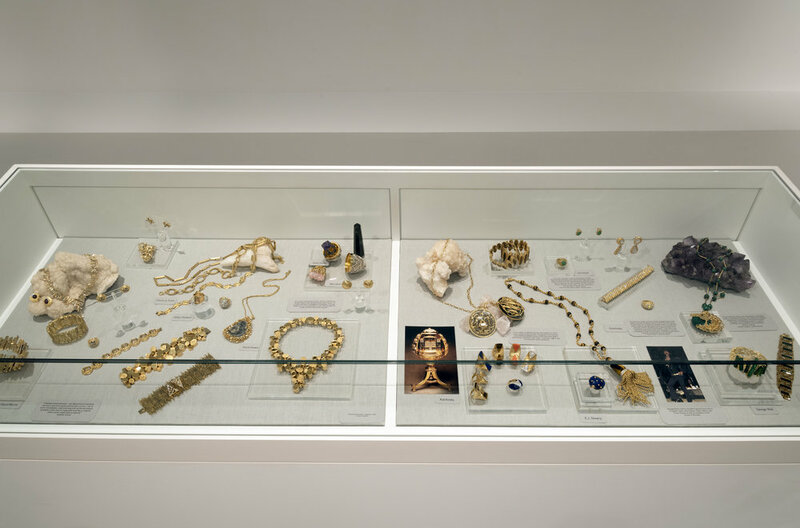 The exhibition continues Mahnaz Collection’s initiatives to draw wider attention to transformative makers and pioneers of independent and artist-made jewelry, many of whom are lost masters. A separate, 150 page, illustrated catalog presents the jewelry; an essay presenting new research on the London Originals and their place in the cultural history of the 1960s and ‘70s by Mahnaz Ispahani Bartos; and an essay showcasing four modern jewelers by British jewelry authority Joanna Hardy. The jewelry in the exhibit includes the works of Andrew Grima, John Donald, George Weil, Charles de Temple, Gerda Flockinger, Tom Scott, Kutchinsky, Barbara Cartlidge, David Thomas, Wendy Ramshaw, and David Watkins. Their work was furthered by the vision and support of forward looking curators, museums, gallerists and writers, including, notably, Graham Hughes, Art Director of The Worshipful Company of Goldsmiths and the Victoria & Albert Museum in South Kensington, London. 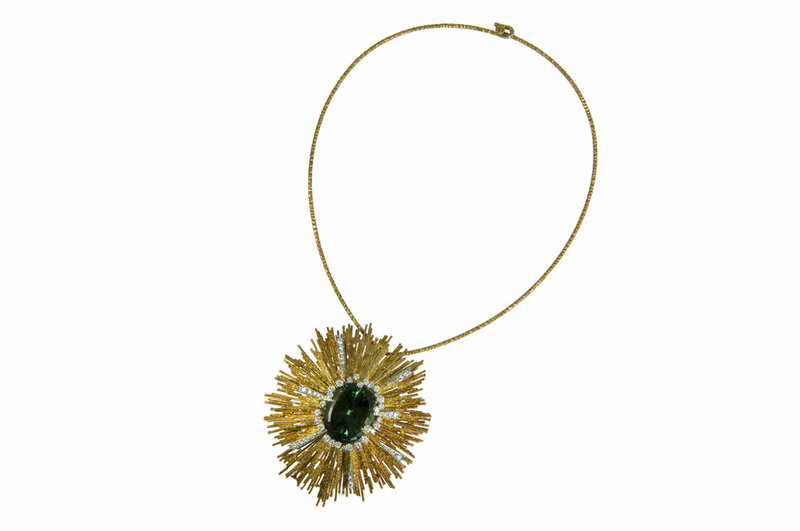 A faceted green tourmaline, diamond and textured 18 karat gold pendant, on an 18 karat gold torque, by Andrew Grima, 1972. A pear shaped cabochon pink tourmaline, diamond, and 18 karat gold nugget flake necklace with melted piercings, by John Donald. The jeweler’s prominent clientele ranged from royalty to trend-setters in the movies, theater and music worlds: Queen Elizabeth II, Princess Margaret, Elizabeth Taylor and Richard Burton, Ursula Andress, Peter Sellers, Glenda Jackson, Margaret Trudeau, Sammy Davis Jr, among many others. Their jewelry can be found in numerous public collections in Europe and the U.S., including the Victoria & Albert Museum, the Goldsmiths Company, the Cooper- Hewitt Design Museum, and the Museum of Fine Arts, Boston. On view at Wright through April 20, 2018, the exhibition will continue until May 11, 2018 at Mahnaz Collection gallery on East 57th Street. Here, the exhibition will be a tribute to the seminal International Exhibition of Modern Jewelry, held at Goldsmith’s Hall, London, in 1961. It will add additional works from the 1960s made by modern jewelers from the United States, the Nordic countries, Switzerland and Italy, all of whom were selected to show work at the 1961 exhibition.